Ralph Findlay makes me chuckle. HERE he is interviewed in Mail on Sunday business section (17 August 2014) rambling on about his 'F-Plan to save the Great British Pub. Now I like a bit of alliteration as much as the next amateur blogger but Ralph is straying into the territory a little too Flippantly For my Flavours. All smiling and happy in front of the bar with a pint in hand ready to pull in his (somewhat in excess of) £500K+ a year pay packet while he pumps out his story about his long tenure at the top of the British Pub Sector; bravely preserving pubs for ordinary plebs like you and me... Oh and while doing so enjoying the opportunity to have a little dig at the pubco's who are even naughtier than Marston's (Punch Taverns in particular - Punch being everyone's whipping boy at the moment) ... and being naughtier than Marston's IS, I assure you as the Pub Persuader, a bit of a challenge when you know what they really get up to in the Fetid Feudal undergrowth that is the #GreatBritishPubcoScam... and don't forget that ALL the pubco's claim to preserve pubs for people and places when, actually, they are all at it, flogging them off as fast as they can as property prices rocket and the British Public hasn't fully grasped the depth of loss that their naughtiness is having on our culture and community everywhere. F-Plan Ralph doesn't mention, of course the other part of his Plan, which proves that he cares to do F-ALL about pubs, really, other than treat them as widgets to be pushed around a balance sheet from one row to another until they fall off the page into a more lucrative form of income for his back pocket sorry his shareholders' long term benefit and the detriment of the publicans who run the pubs and the communities they serve... As in the not long past case where Ralph sold off TWO HUNDRED AND TWO of Marston's under-performing (as far as Ralph's bonus scheme dictates) community pubs to New River Retail for £90 million. That's what Ralph spends on New Builds every year so a nice flip from Out With the Old (and all the tenants and the communities they served, to an out and out property developer who works with Tesco and Coop among other not pub interested co's) to In With the New - the high EBITDA Marston's Managed chain of modern pastiche pubs that are branded, blanded, carbon copied and rolled out across the country, where every Monday is Burger Night All Day and the food and beers are the same from John O'Groats to Land's End. You Are F-PlanTastic Ralph! Pub lovers all over the British Isles Salute YOU! 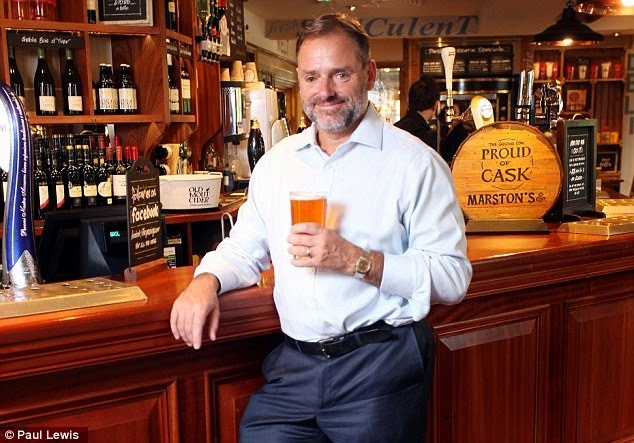 UPDATE 20 August 2014: Ralph Findlay blames Politicians for the failure of Marston's pubs. Update 5 October 2014 Sunday Express announces Marston's 6% fall in like for like sales. Looks like Ralph's genius and complacency is really shining through, like all Pubo's execs he'll blame the weather rather than his company's poor pubs and beer for the fall. Whatever else it's certainly a novel concept for a CEO to run his company for the long term benefit of his shareholders! The British people consider themselves stakeholders in British pubs, Ralph Findlay clearly from his actions over decades, does not. He is a stakeholder in a beer and pub company who's running the company (as an employee, it is NOT 'his company) to maximise profit to the detriment of authenticity, individuality, originality and corporate moral integrity. The real stakeholders in pubs are the people who run them, the people who use them and supply them with goods and services and the people whose communities are served by their catchment. Shareholders and Boards of directors are not engaged with pubs the way these stakeholders are. They are remote, hands off and isolated from the impact of their actions. They do not use the pubs other than a profit stream. If I'm reading your post correctly, the only people who aren't really stakeholders are the people who've invested their money in the company. Come on. They didn't invest their money in pubs. They put it into a high earning fund that aims to return unsuitable profitability year in, year out, that's dependent on borrowing on top of equity investment and getting involved in business practices that might increase sales and return of widgets but leads to massive disposals of pubs all over the country, destroying the lives of hundreds of publicans and their families, damaging communities and erosion of British culture, traditions and our very unique sense sense of place. Beer and Pub Companies could earn good returns without destroying pubs but corporate culture and the insatiable need to deliver ludicrously unrealistic returns had made the CEO's of these companies incapable of acting for the LONG term and retaining integrity. Even. Adnams have fallen for the allure of this model. It's tragic that profit is put before all else when operated responsibly there would be enough to go round and to effect great change positive change at the same time. There's a absolutely no understanding of the value of building Social Capital, sustainable business practices or of planning for the long term. Marston's actions prove this. The answer seems obvious. Get yourself off to the bank, borrow some money and convert a few shops to the sort of pubs that you like, returning the level of profit that you think is appropriate, and wipe the floor with this awful company. It's a fact of life that those who own the assets have the most say in how they're operated, and I certainly don't pay my pension fund to do anything other than get the best return they can from their (my) investment for my future, not that of the "community" nor indeed publicans. And I think we're bound to differ on this.